these were the things that made the step familiar is a project by Glasgow-based artist Emmie McLuskey, which explores interactions in and between bodies and the systems that control and record these interactions. Taking a research-based approach for this project, McLuskey questions how the moving body has been represented historically, referencing the work of a variety of individuals of past and present: filmmaker Maya Deren (1917–1961), anthropologist and choreographer Katherine Dunham (1909–2006), a notation system developed by dancer and choreographer Rudolph Laban (1879–1958), contemporary Jamaican poet Millicent A.A. Graham and researcher Freya Field-Donovan. 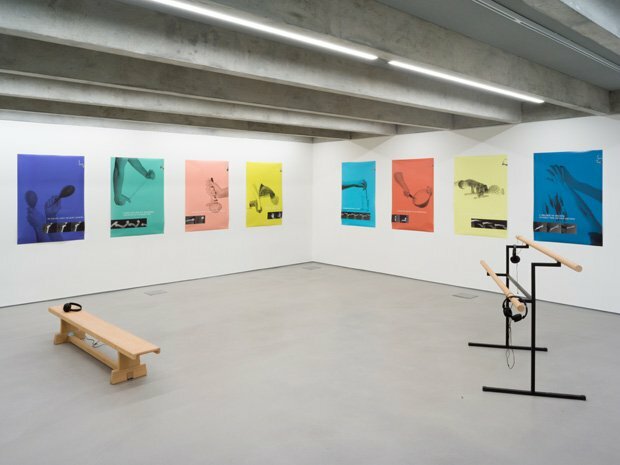 The exhibition space contains eight colour prints mounted on the wall, depicting hands holding objects and evoking movement; a visual amalgamation of Laban's notation system, British Sign Language, poetry and photography; as well as two pieces of furniture which visitors are encouraged to interact with, built by McLuskey. The furniture was inspired by 'the formal language of dance equipment and education': a ballet barre and gym bench, both being educational spaces to sit/stand/read/watch/listen. Embedded into the two objects are three different sound pieces for visitors to listen to via headphones, which all convey messages about movement and learning: one piece describes floating, whilst the other two show different stages of learning and teaching a language (in this case, French). these were the things that made the step familiar is an immersive exploration of bodily interactions which encourages visitors to acknowledge vision, sound and movement, and their relationship to one another. The collaborative nature of the project provides a multi-faceted approach to the way that bodily knowledge is shared and passed down through time. Collective, Edinburgh, until Sun 10 Mar. Emmie McLuskey is part of Collective's development programme for emerging Scottish artists and producers. Glasgow-based artist Emmie McLuskey presents her new exhibition 'these were the things that made the step familiar', featuring print, sculpture, sound work and poetry.